It’s not everyday that we see noteworthy television advertisements. Some ads, like Colt 45’s series of commercials a few years ago, grabbed our attention for all the wrong reasons. Recently, fast food giant McDonald’s released a heart-tugging commercial featuring a man in his mid to late 20s, clad in office attire, having breakfast with his older brother. Older brother (OB): Kumusta crush mo? Younger brother (YB): Okay lang. Kuya, nag-smile na siya sa akin! 1. The younger brother is a certified eye candy. The guy looks familiar. He must have appeared in other ads before. 2. The situation is very familiar for most of us. Isn’t it that we really enjoy talking about our crush(es), especially out interactions with them, to those close to us? 3. “Kuya” is stressing to us the importance of not appearing too happy especially when your crush is just around the corner. “Wag masyadong ngiting tagumpay,” as some quip. 4. 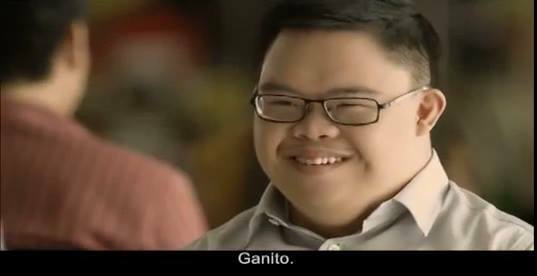 Of course, the biggest star in the ad is “Kuya” and everything else his character represents. The recent midterm elections is noteworthy for many things, but one should never lose sight of the fact that in that election cycle, the Commission on Elections together with its partner agencies implemented a concerted effort to help persons with disabilities (PWDs) register and vote. As a result, a reexamination of how our society regard PWDs has been going on. Let’s now examine the McDo ad against that background. For one, when was the last time that a PWD appeared in a TV commercial? The advertisement shows that PWDs are totally capable of engaging in casual conversations just like anyone else. This entry was posted on Sunday, August 4th, 2013 at 10:09 pm	and tagged with kumusta crush mo, kumusta crush mo mcdonalds, mcdonalds ad kuya, mcdonalds commercial kuya, mcdonalds philippines commercial 2013, mcdonalds philippines kuya, smile ka din konti lang, smile ka din onti lang and posted in commentary, hodgepodge, philippines. You can follow any responses to this entry through the RSS 2.0 feed. « Chito Miranda Neri Naig scandal video? Great post and right on! My first job in America when I graduated college, and for the next 10 years, was working in a State funded Developmental Center that had more than 300 residents with PWDs, both male and female. The mission of the center was to teach the residents life skills development, with the ultimate goal of independent living. Some residents had basically been discarded by their families because they were ashamed and other residents were placed in the center so they could learn how to live independently as possible, since parents realized that they would not always be around to take care of a special adult child. A number of residents were able to secure jobs in the community, which they could perform, and have their own place to live. They could not only carry on a regular conversation, they could do some job tasks very well and some had girlfriends and boyfriends! They not only had a good quality of life but they were also contributors to their community. No matter what age, most of our residents always looked forward to the Special Olympics every year and some were actually very good athletes.